Betula pendula 'Youngii' is a tried and tested performer in our climate and soils and has been a British garden favorite for many years. With its branches reaching to the ground and dome-shaped head it is an effective specimen for a small garden. Youngii is the smaller of the two weeping birches we grow - in most cases it will do exceptionally well to exceed five meters. It has a remarkable weeping form, barely entitled to be classed as a tree owing to its extreme pendulous habit. The slender branches eventually reach the ground and the serrated, triangular leaves show good autumn colour. 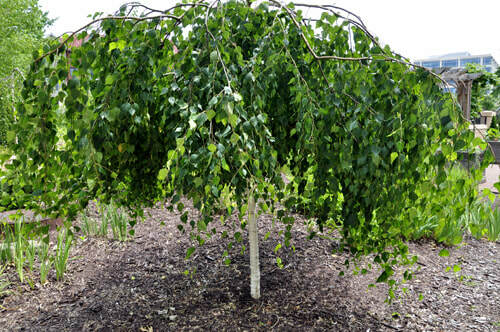 It develops a smooth white bark and is an attractive tree when stripped bare during the cold winter months. Youngii adds character and architectural design to any garden. Very hardy.